Hosley's 9'' Long, Decorative Tabletop Black Metal Vintage Car. Ideal Gift for Wedding, Home, Party Favor, Spa, Reiki, Meditation, Bathroom Settings. Super Savings Item! 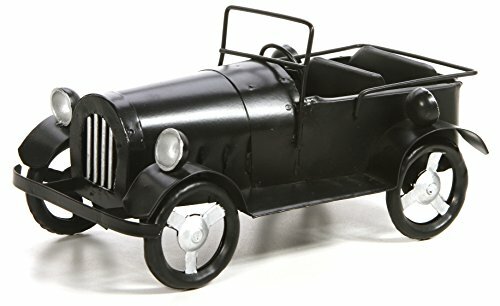 Save 31% on the Hosley's 9'' Long, Decorative Tabletop Black Metal Vintage Car. Ideal Gift for Wedding, Home, Party Favor, Spa, Reiki, Meditation, Bathroom Settings. by Hosley at My Natures Treasures. Hurry! Limited time offer. Offer valid only while supplies last. Hosley's 9'' Long, Decorative Tabletop Black Metal Vintage Car. Ideal Gift for Wedding, Home, Party Favor, Spa, Reiki, Meditation, Bathroom Settings. PRODUCT: Hosley's 9" Long, Decorative Tabletop Black Metal Vintage Car. MEASUREMENTS/MATERIAL: Each one measures: 9"L x 5.25"W x 5.5"H and is made of iron.